I’m pretty sure that in every introductory interview I’ve done with a Muslim athlete, I’ve asked about Ramadan. The holy month of fasting, which is the fourth of Islam’s five pillars, is a unique challenge (albeit a highly rewarding one) that more than one billion Muslims around the world face every year. It is especially interesting for me to learn how Ramadan is confronted by high-level athletes, whose current and/or future livelihood depends on keeping their bodies in prime physical condition, but whose obligation to Allah [swt] calls them to forgo food and drink during daylight hours for 30 straight days once a year. From the pro football player to the college track athlete to the high school recruit, each Muslim athlete approaches Ramadan in their own way. Retired NBA legend Hakeem Olajuwon, one of the most accomplished Muslim athletes in history, recently spoke to The Guardian about his experiences playing basketball during Ramadan. Click here to watch the video. A lot of people might be surprised to learn that Olajuwon’s stats were higher during Ramadan, and that he felt lighter and more energetic than at other points in the season. 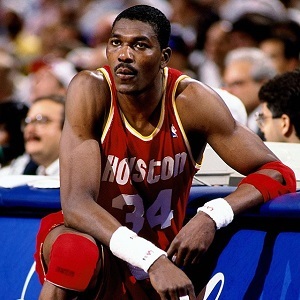 Especially when his job involved going toe-to-toe with some of the greatest NBA players in history: Shaquille O’Neal, Patrick Ewing, David Robinson, Alonzo Mourning, Robert Parish and Dikembe Mutombo were some of the superstar centers and 7-footers who played against Olajuwon during his 18-year professional career. Olajuwon was voted NBA Most Valuable Player in 1994, he was a two-time Defensive Player of the Year, he led the Houston Rockets to back-to-back championships in ’94 and ’95 (in which Olajuwon was named NBA Finals MVP both times), and he finished his career averaging 21.8 points, 11.1 rebounds and 3.1 blocked shots per game. Olajuwon, 53, retired as a player in 2002. He was inducted into the Naismith Memorial Basketball Hall of Fame in 2008. Three years ago, I converted to Islam. I took my Shahadah on July 22, 2013, right in the middle of Ramadan. Through my years of studying Islam prior to that moment, I knew in theory what I was doing. And yet I was still not prepared for all that Ramada entailed. The first day I tried to fast, I was stricken with headaches and fatigue. When the sun went down and I was able to eat, I ate too much. After a few more days of the same, I admitted that I wasn’t ready to dive into Ramadan mid-month. I forgave myself because I was literally a brand-new Muslim, and vowed to do better the next year. In the two Ramadans that I have successfully made it through since then, I’ve found that Olajuwon is correct about staying active while fasting versus staying stagnant. For me, at least, laying around all day just makes me think more about the fact that I’m not eating or drinking anything and makes the hours go by slower. As my work schedule already makes me more likely to exercise at night, I haven’t done anything nearly as physically strenuous as playing an NBA game during the day while fasting, but I do prefer to move around and be active, as Olajuwon talks about. Shahadah — The declaration of faith for a Muslim, which is, “I testify that there is no God but Allah, and I testify that Muhammad is the Messenger of Allah.” It is the first pillar of Islam and is the first act of the newly converted Muslim. “swt” — Shorthand for “subhanahu wa ta’ala,” which translates to “The Most Glorified, The Most High.” It is one way in which Muslims glorify Allah after mentioning His name. Is boxing really better without Mayweather?